We made it thru the Smokies and are on our way. This blog took place a few weeks ago, so I am catching up! The temperatures dipped to -3, the winds rose to 100 mph. Sheets of stinging ice pelted down from the dark, merciless skies. We decided taking a zero was probably a good idea. We bummed some floor space with the tramily, Legs with Lumber Jill and Sherpa, myself with Scarecrow and Wheels. 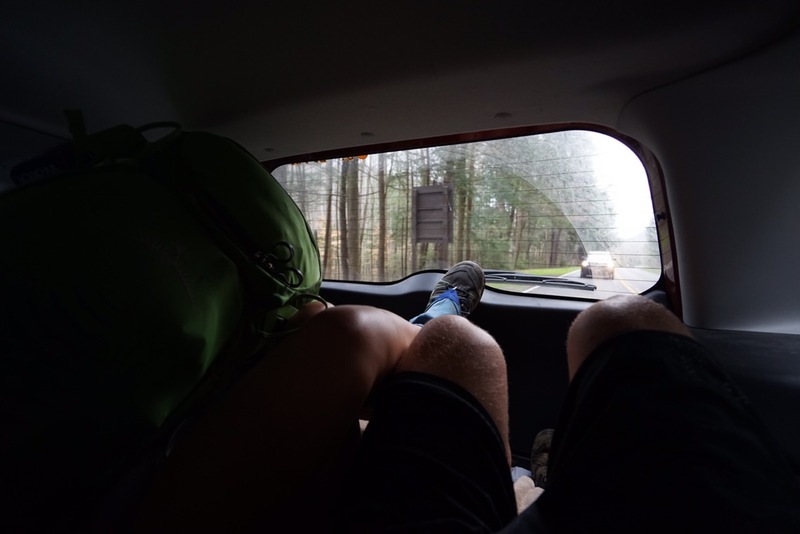 We beat the freakish weather with heeping portions of food, trail stories, and a particularly gruesome half hour, where Scarecrow finally lanced the large blood blisters on his heels. The following morning would be bittersweet, as Scarecrow would need to zero again so his feet could heel up. Scarecrow, wise as ever, asked why we were leaving, seeing as it would be only marginally warmer and less windy than the day before. 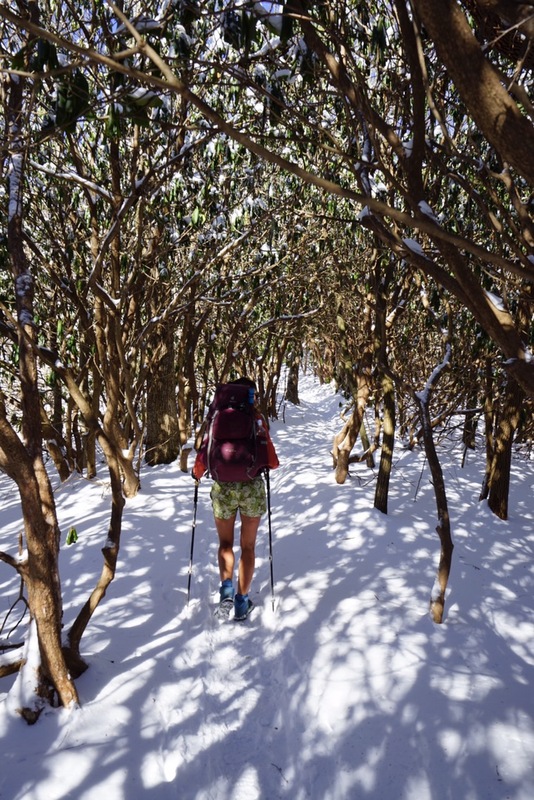 Alas, the trail was calling. We hiked out with Wheels, Lumber Jill, and Sherpa. The climb out of the NOC is long and arduous, though punctuated with some flat respites. It’s like a long staircase, not necessarily super steep, but long enough to turn the legs to jelly by the end. We started hiking around 9am. Despite it being 20 degrees, Legs left in shorts. We climbed and climbed, through piles of snow, some drifts topping off at a foot and a half. The cold was somewhat bearable, as we were hot from the climb. It was the wind that really tore at the morale. Exposed ridges turned into firing ranges, where frozen projectiles were cruelly blown into the eyes and face, seeking out any exposed skin. Legs’ legs looked sunburned and swollen, her blood making a valiant effort to fight the freezing, cold wind. Views like this cost a burning sensation in the facial region. After about 7 miles going up, we saw the outline of a shelter to the west, and quickly made for it’s refuge. Legs finally put pants on, we ate a frozen snack, and then we just left. We just went back out into it. It took a lot of mental discipline to not just take our sleeping bags out and curl up in little wimpering balls. But there we were, heading back into the icy maelstrom. Turns out, it’d be worth it. 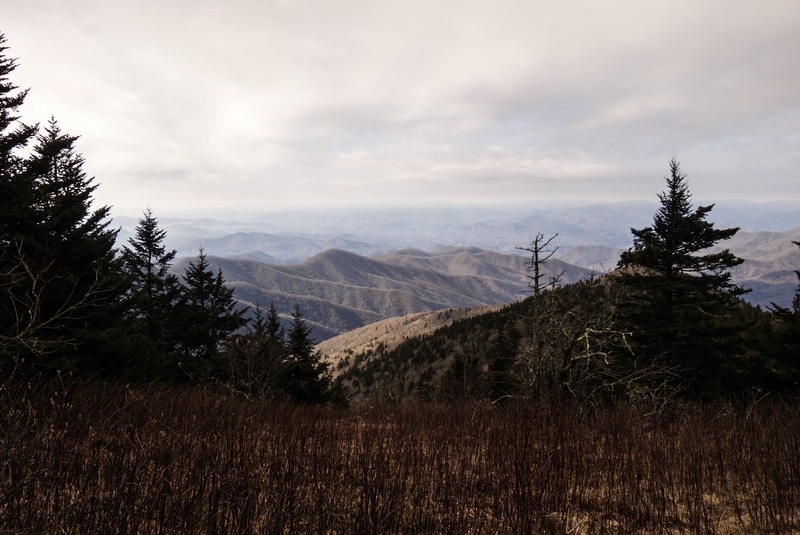 The wind died down, and the exposed ridges turned from firing ranges, to smorgasbords of views. 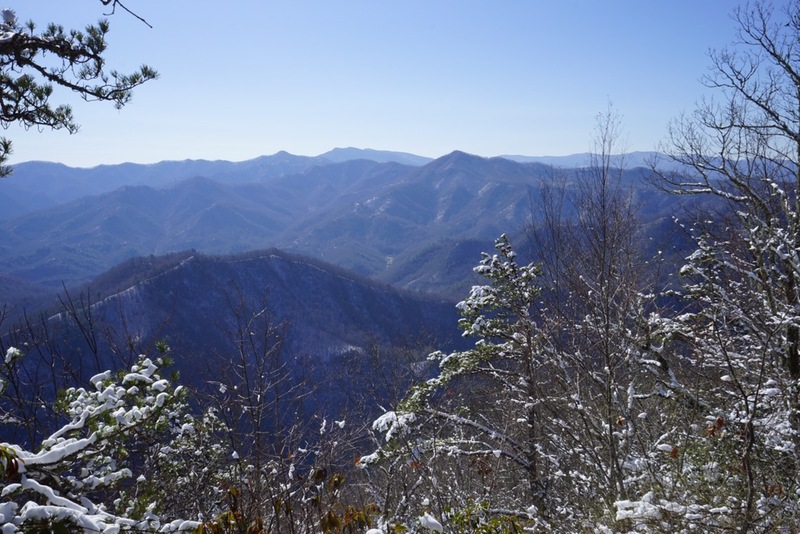 The mountains were salted with white as far as the eye could see, cutting down into the Nantahala Gorge and beyond. 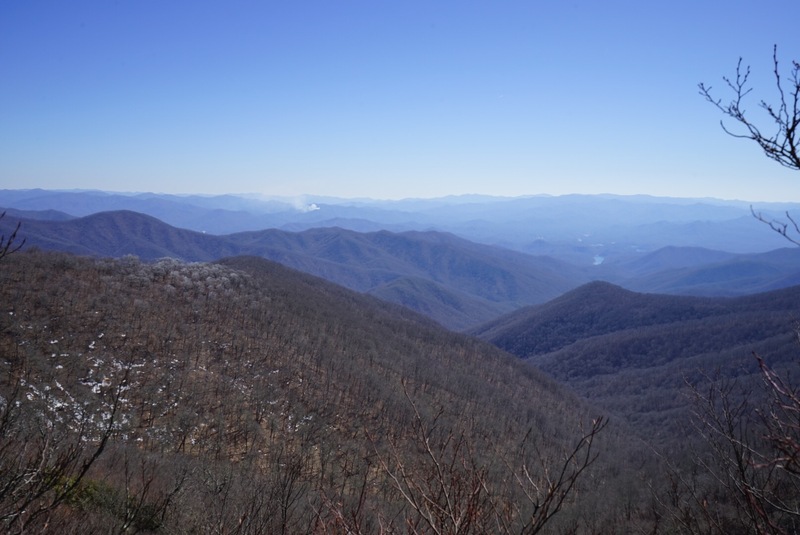 The climb finally ended after 8 miles, topping off at Cheoah Bald. 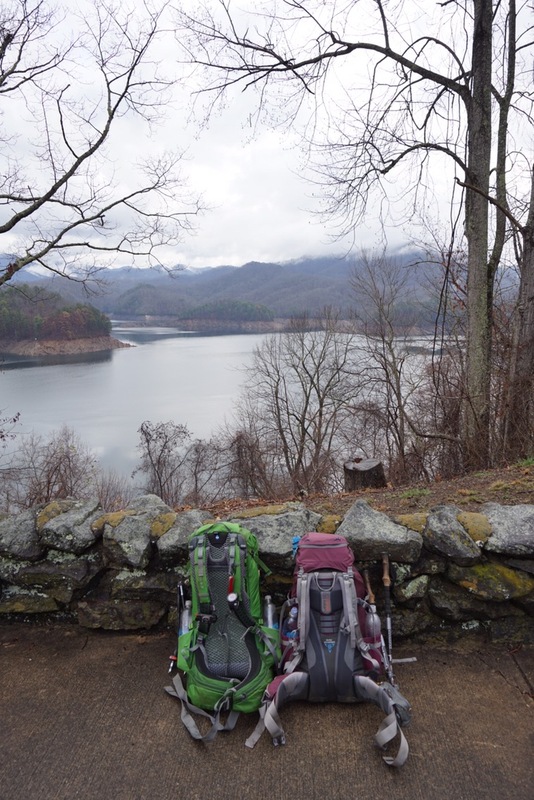 If you are reading this, and looking for special camp spots on the AT, this bald is one of them. Unfortunately, it felt only a little warmer than the surface of Pluto, so we chose to keep going. Down, finally. We had done it. In the 16 mile day we’ve planned, we had bested the hardest part of the day. All that lay before us were easy ups and downs. We would saunter into camp like heros. Yea, no. For a time, the trail was what we thought. Some puds (pointless ups and downs), but that was expected. We would suffer for our hubris. Jacob’s Ladder is fucked up. With a name like Jacob’s Ladder, I assume this climb’s namesake is connected to some sky wizard mythology, so it made sense when Legs and I held our fists to the sky and cursed the trail gods. Straight up. Those two words describe the JL with exactitude. No switchbacks, no dips, no flattened off traverses. Just up the vertical shoulder of a nameless peak. Maybe a mile long, it felt like the previous 14 miles condensed down into one climb. All thoughts of conquered land were forgotten, the saunter left our gait. We slogged, puffing away and dripping, looking less like heros and more like two clowns on the verge of cardiac arrest. 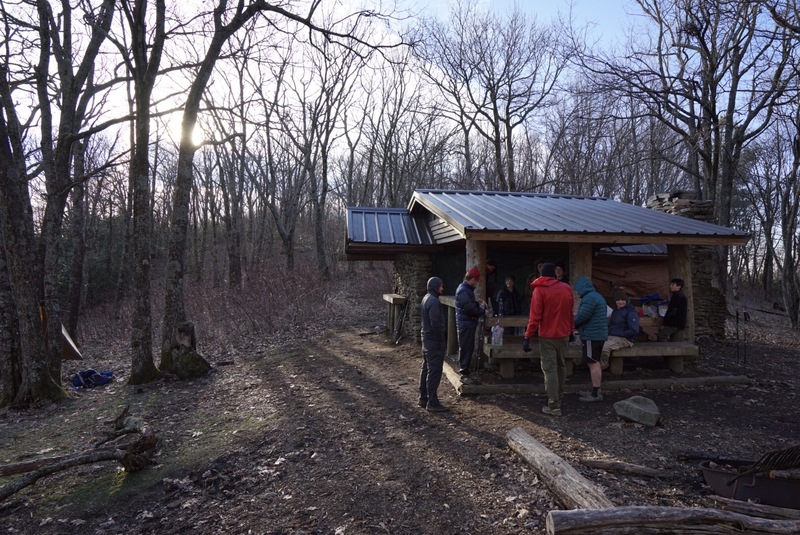 Brown Fork Shelter was home for the night, not only because we wanted the added warmth you can only get by spooning with strangers in a shanty in the woods, but also because there weren’t any tent sites. Luckily someone had lashed a large, heavy, tarp along the open side to cut wind and trap heat. It did the former only so well, the latter not at all. Inside, shoulder to shoulder, lay Legs, myself, Wheels, Lumber Jill, Glim Glom, and Honey Badger, the last two, new additions to the tramily. With our combined heat, it was a toasty 35 degrees. At least it was better than the outside 23. Low and behold, the next morning was frigid. 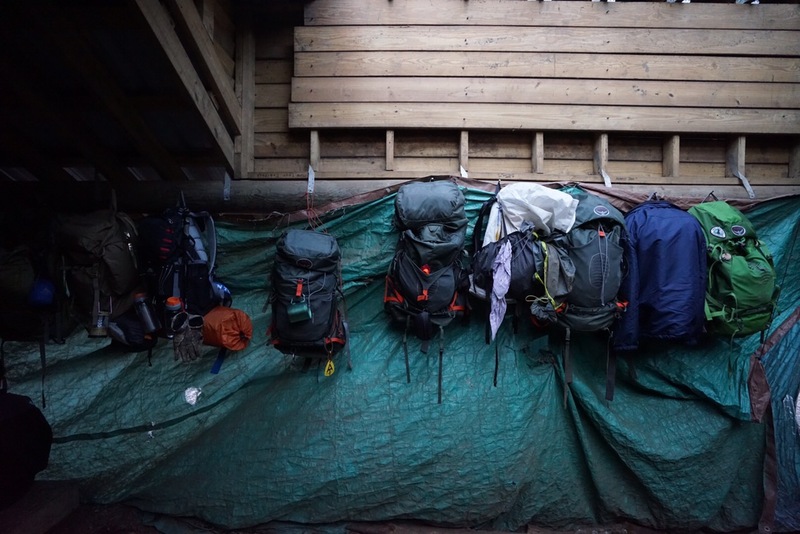 Again, it took more than I’m willing to admit to get out of my sleeping bag (Nemo Nocturne 15), and deflate my sleeping pad (Nemo Tensor 25L). Legs and I coerced each other out, with heady promises of town food only 12 miles away in Fontana. I’m pretty quick. I usually cruise at 3 mph, and can hit 4 mph if I am really motivated, and the terrain suites it. Put the possibility of town food in front of me, and I’ll rotate the Earth underneath me. Perhaps that’s why I did those 12 miles in 3.5 hours. 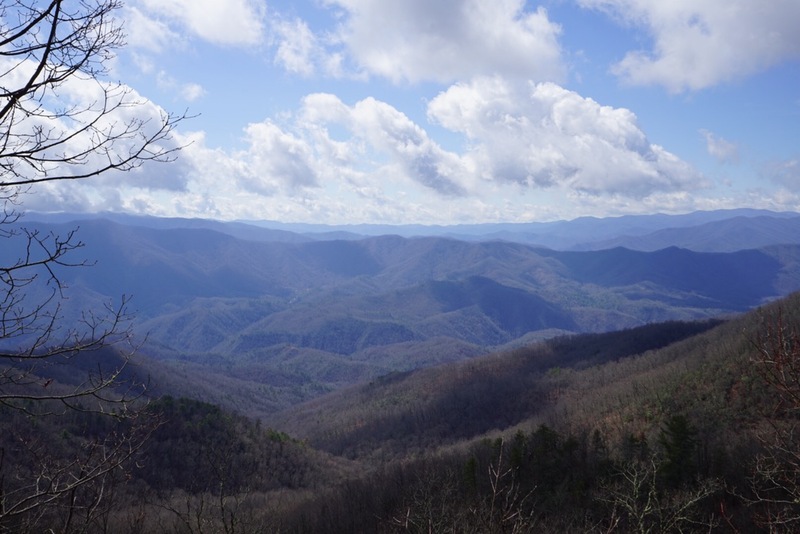 Hiking from Brown Fork was considerably easier than the previous day. 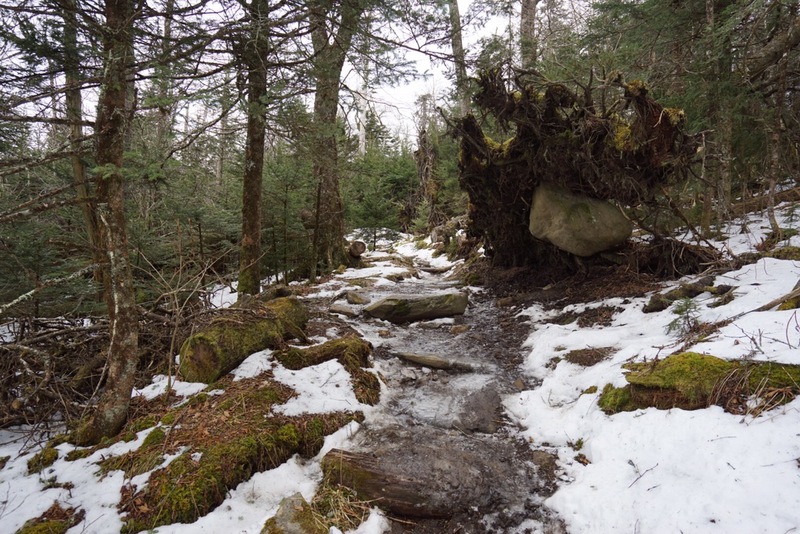 Much of the snow had melted, and the climbs weren’t generally significant. The only problem now, was the ice. Parts of the trail had frozen completely for meters with no shoulder to skirt around. It was slow going on these parts, except when you slipped. Then, you very quickly made yourself look like an idiot, arms flailing to get trekking poles down, usually as one leg swept up like that of an inept ballerina. I went down fully twice that day, and slipped more times than I can remember. 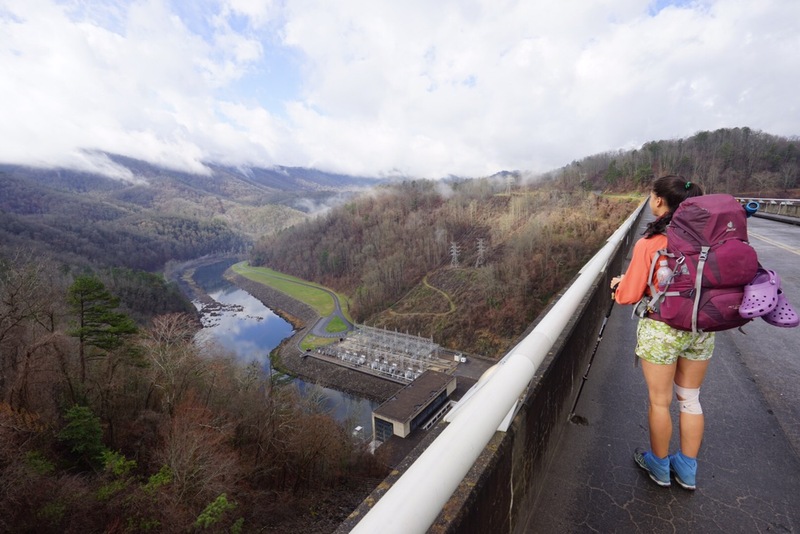 Descending to Fontana Dam is somewhat infuriating. Along side the momentum halting ice, you can see the dam from miles away, making you think you’re closer than you are. There’s almost nothing worse out here, than thinking you’re closer than you are. You keep thinking, “Ok, THIS has to be it.” It never is, and you lose your mind, tacking on a few more mental miles. We stayed at the Fontana Hilton, picking up our mail dropped resupply, and a few other surprises. Legs would now be packing out purple Crocs curtesy of my mom. She had chosen purple because of Legs’ NYU roots. Stylish, sentimental, and practical. Thanks mom. The Lodge is nice, but a little pricey. 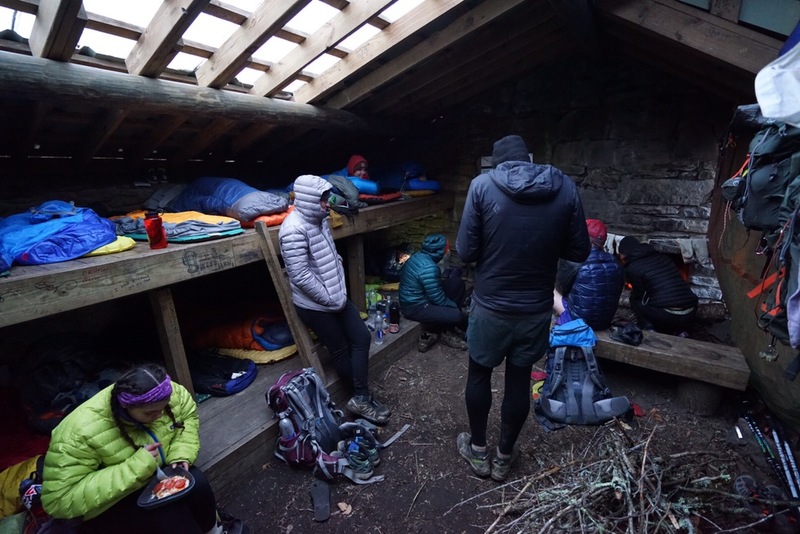 However, thanks to Legs’ parents (again our parents coming through with some trail magic) we had a private room to shower, do laundrey, and avoid the impending rain. 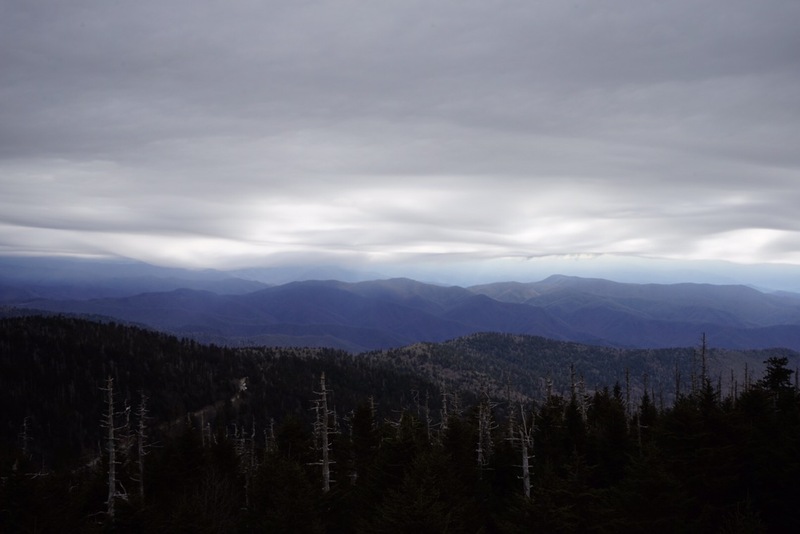 Entering the Smoky Mountains was definitely an occasion for us. 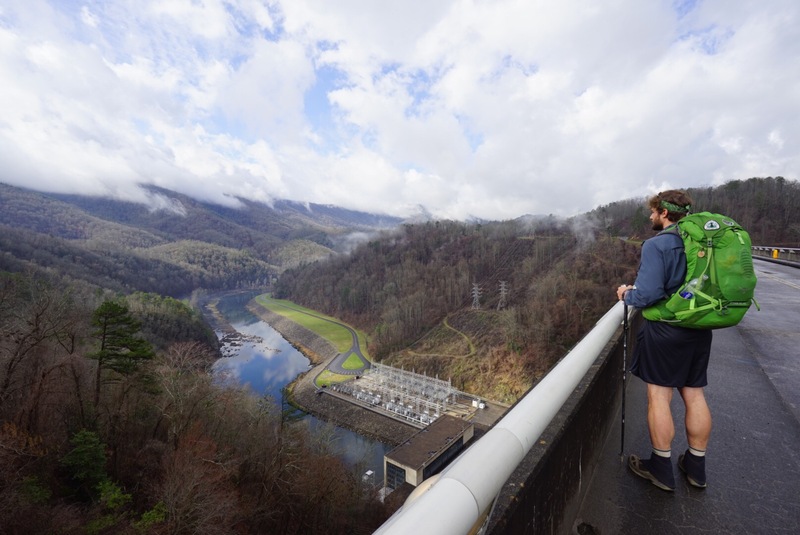 Guarding the entrance to this myatical land, lay a concrete behemoth, the Fontana Dam. As you traverse it’s quite magnitude, you can’t help but revel. To our right, a steep shoreline and surrounding coniferous forest were reflected perfectly in the still lake. To our left, dropped away the dam, down to some electrical equipment, and a lazy river, curling away through the gorge. 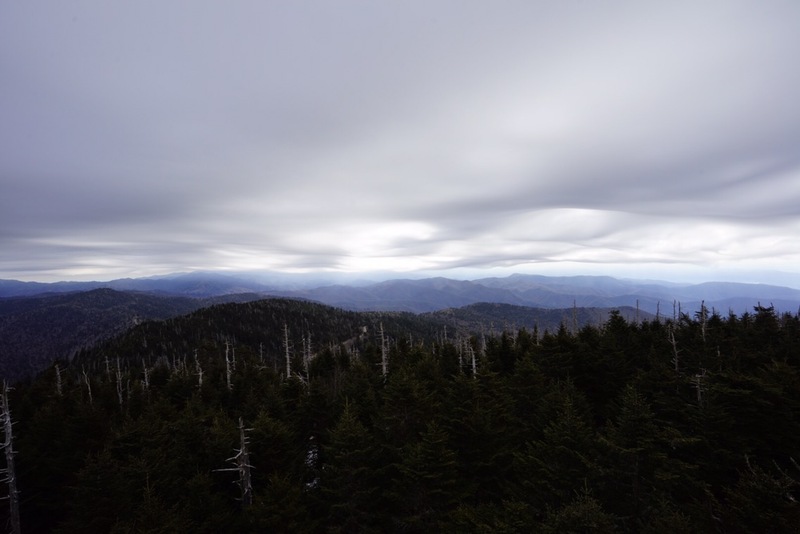 Before us, clouds tearing on their jagged peaks, loomed the Smokies. We entered the Park, putting our permits in the box, and starting the approach. 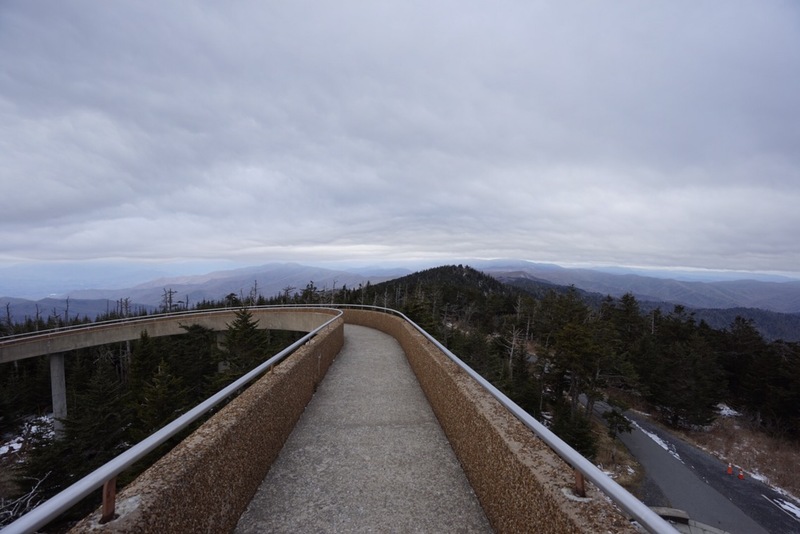 The climb into the Smokies isn’t easy, but next to the climb out of the NOC and Jacob’s Ladder, it was bearable. The weather was stunningly perfect, a stark contrast to the grey, rainy morning. 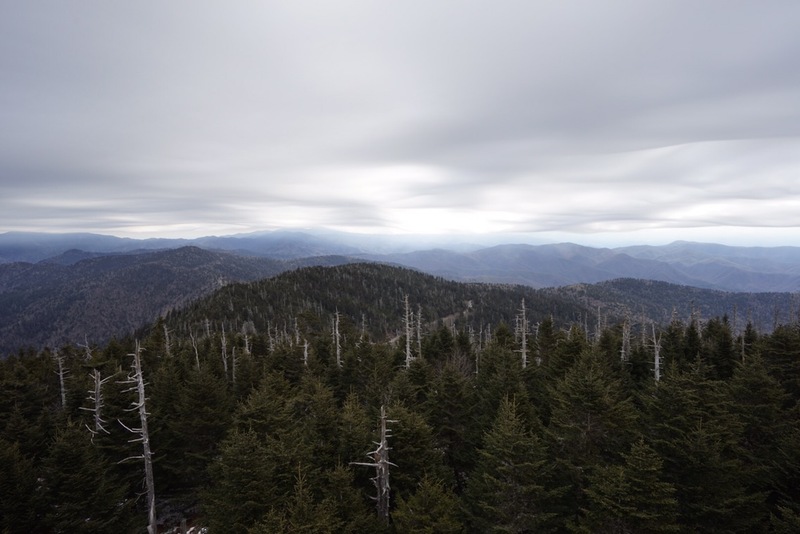 Little did we know how the Smokies worked. Once the initial climb was bested, the trail levels out to cruising grades, with many a vista popping up in your peripherals. 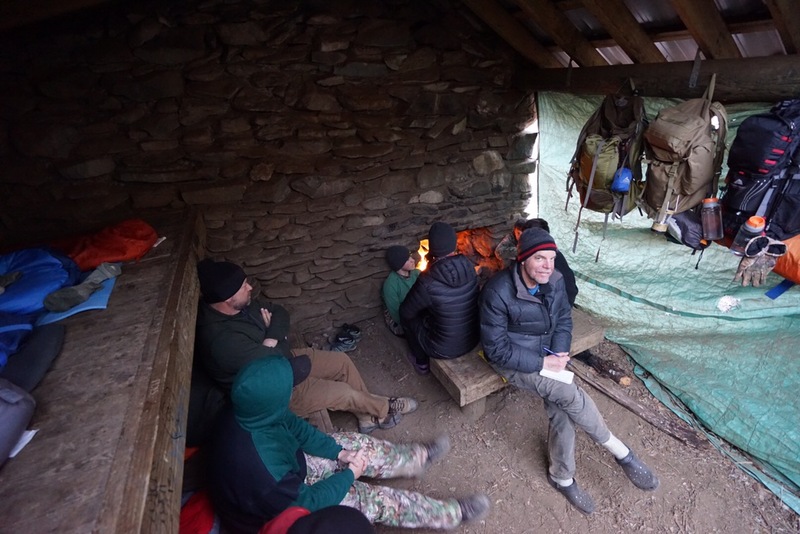 We hit Mollies Ridge Shelter to snack down, and listened to a Ridgerunner about the trail between here and the next shelter. Apparently, it was an easy 3.1 to the next shelter, so we pushed on. 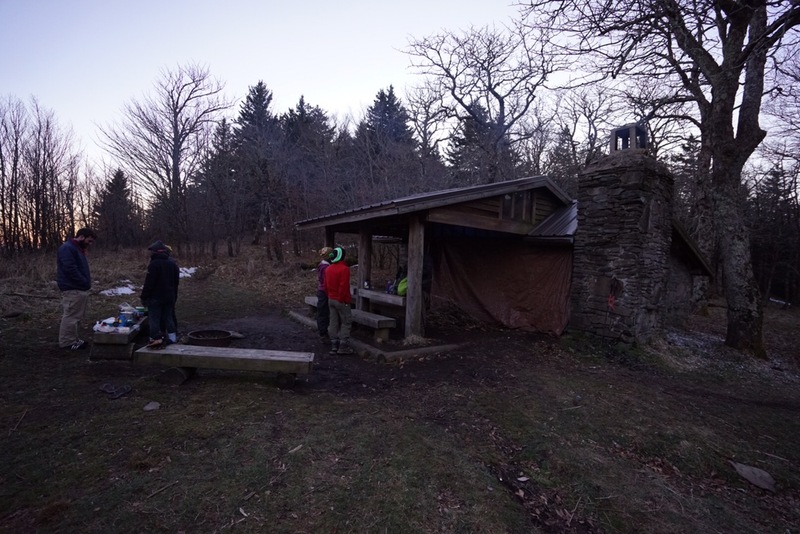 We shared the shelter (Russell Field) with a boyscout troup. For some reason, the scouts were much more keen on speaking to Legs than me, though I did get a few questions. Like, “How long have you been together?” Or, “Do you think you’ll get engaged?” I made it clear, Legs was with me, and not into 12 year olds. Sorry boys. 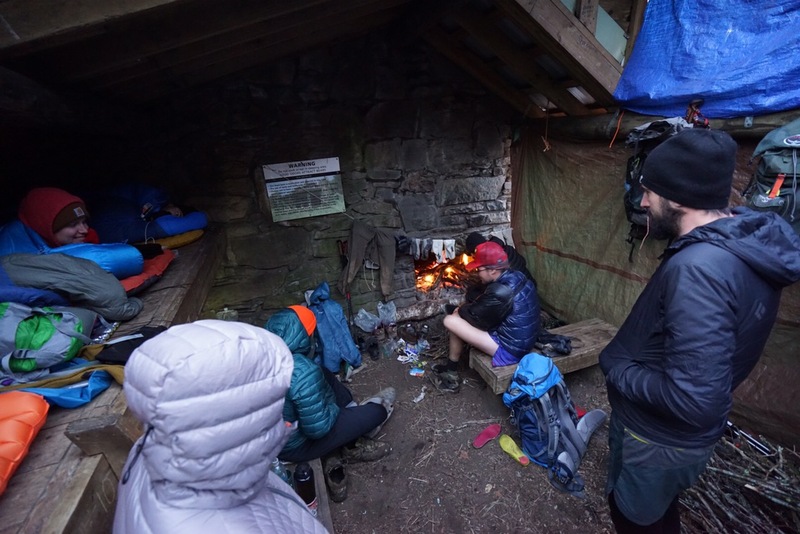 The shelters in the Smokies are massive, and all come equipped with a fireplace. 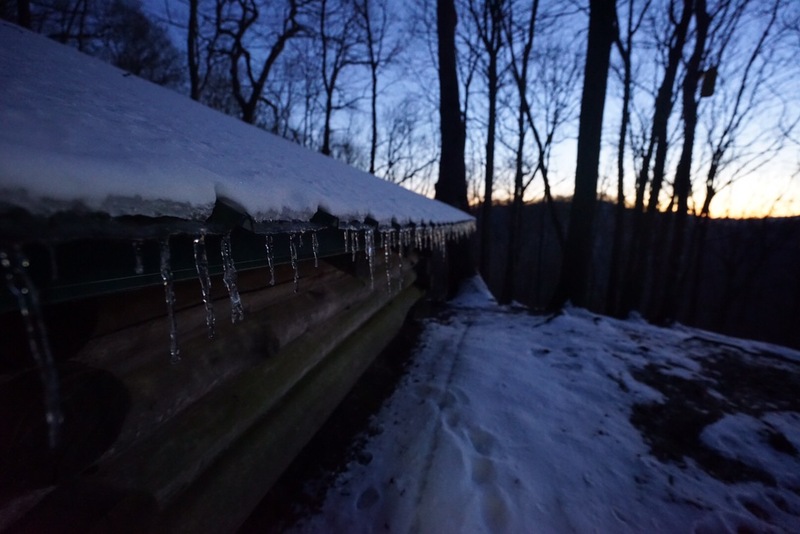 Normally wood, Smokies shelters are three sides of piled stone, and rangers have strung up tarps to act as the fourth wall. We squeezed 15 into the two bunk levels, and the scouts kept the fire going well into the night. It was lovely and warm, despite the symphonic snoring. The fire in the shelter. Barn Owl looks up at me. 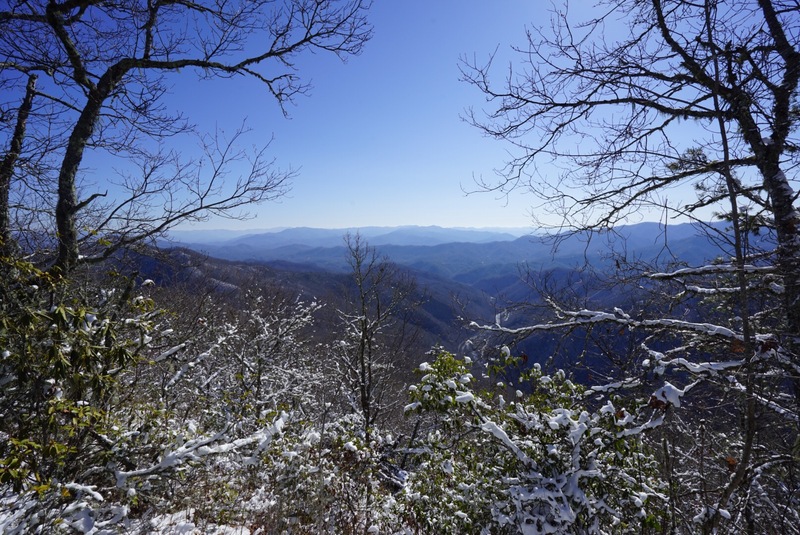 Where the previous day was bright, sunny, and relatively warm, the next day could not have been more different. Poking my head out through the tarp, a freezing wind slapped me hard in the face. We were socked in a sharp, and cold mist, which had coated every surface, organic or otherwise, with horfrost. A billion tiny ice stilletos poked out of every twig, needle, and rock. 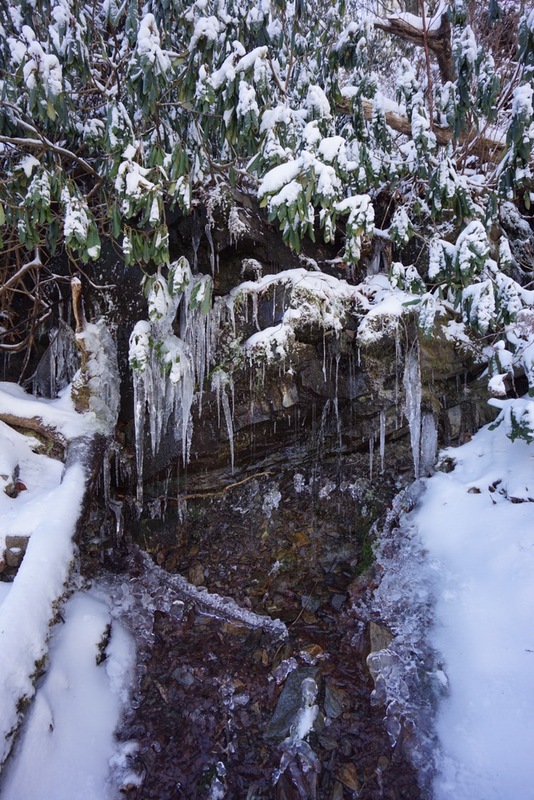 The trail itself was a frozen river, adding to the dangerous visage. We plodded along slowly, every other step, slipping backward on the ice. Views that should have been stunning, were relegated to curtains of silver, though we were unperturbed. The new terrain and conifers, coated in the horfrost spikes was it’s own treat. 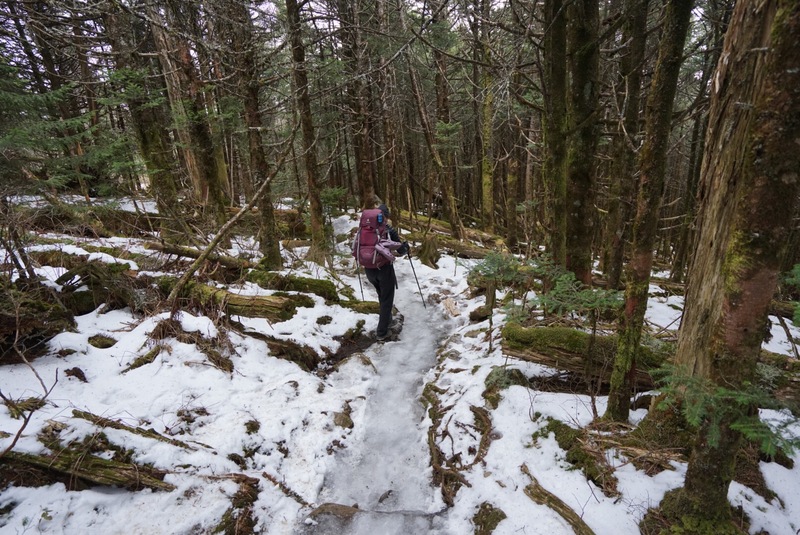 We could have done with less ice on the trail, but such is life. Could have my camera out during the bad part of the day. But you can see the ice here. At high noon, as if a switch had been flipped, the sun burned away the mist, and the skies opened. 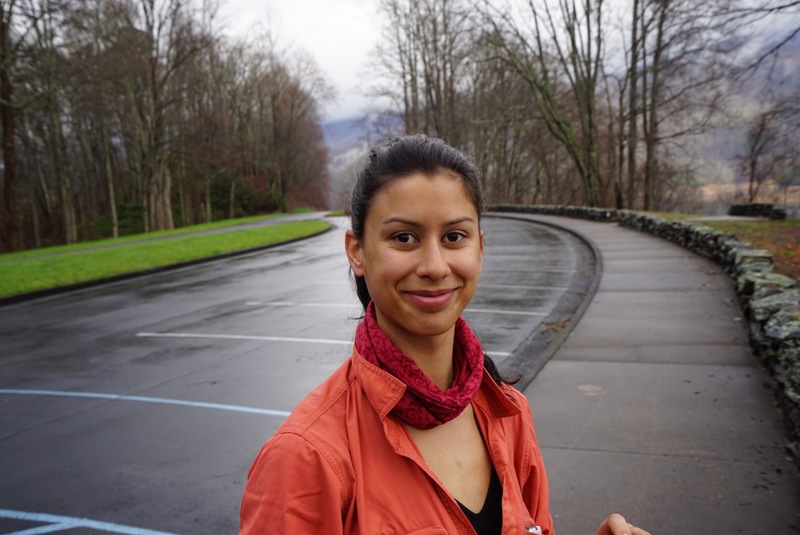 Suddenly, we were hiking in a different season, the sun out, and the biting wind subdued. 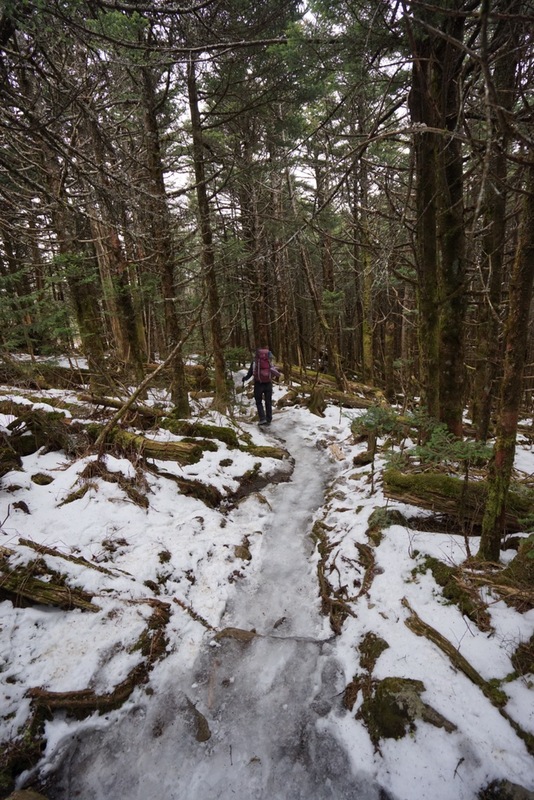 The trail began to melt, creating a muddy rut to walk through. The ice stilletos fell off all but the conifers. 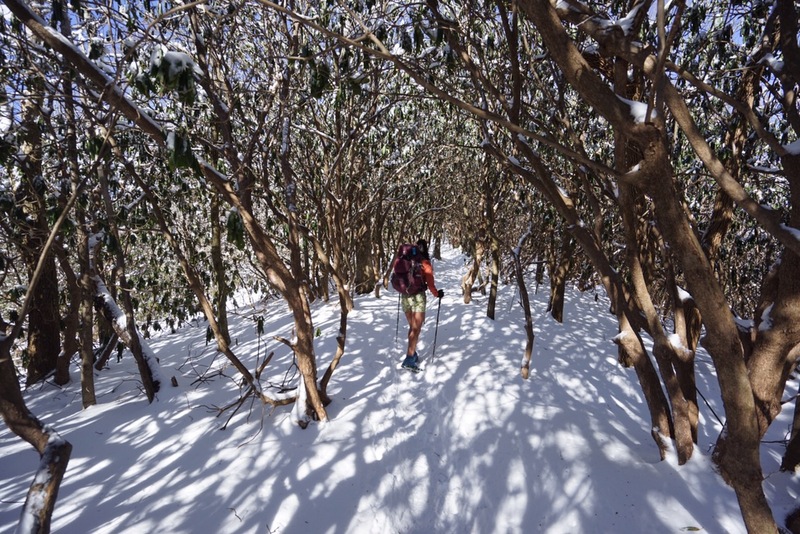 It was a strange sight, coming into our next shelter, to see winter and spring jostling for purchase in the foliage. Our shelter for the night was Double Spring Gap Shelter. 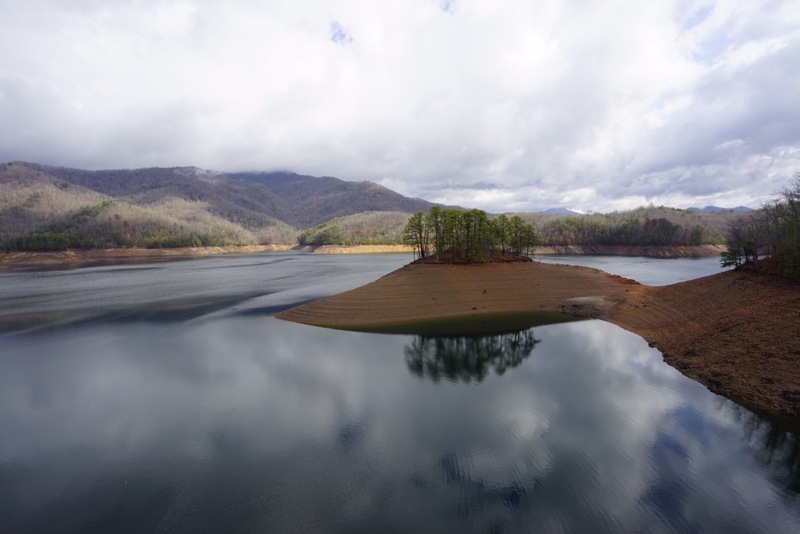 So named because of the two springs flanking it, one in North Carolina, one in Tennessee. We opted for the NC spring as it was just a little closer. 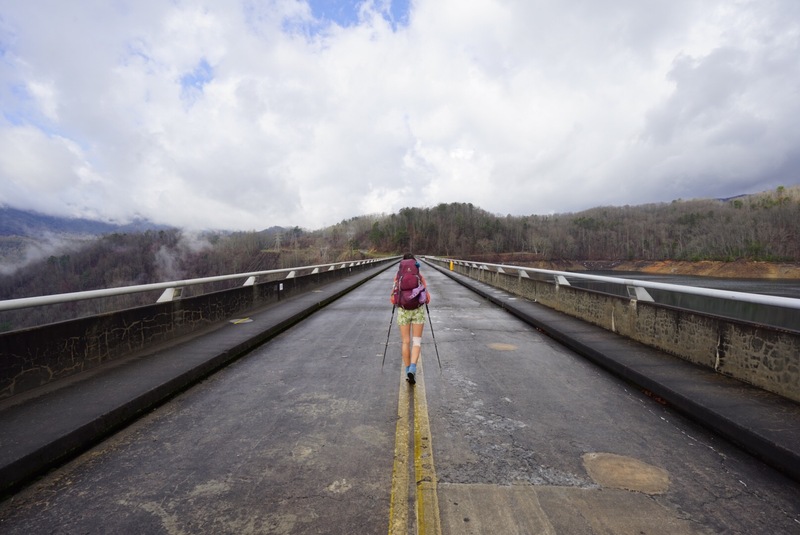 We may be hiking 2200 miles, but that doesn’t me we walk for no reason! Double Spring Gap Shelter. Two Springs in two states! No scouts tonight. Instead an 8 person group on Spring Break. Still, we had space in the shelter to hunker down for the next. Other hikers included Glimglom, Strider, Honey Badger, Wheels, and Lumber Jill, our adopted tramily. It rained hard overnight, and by morning, like clockwork, the freezing mist rolled in. All that rain had frozen, again turning the trail into a rink to be flopped over. 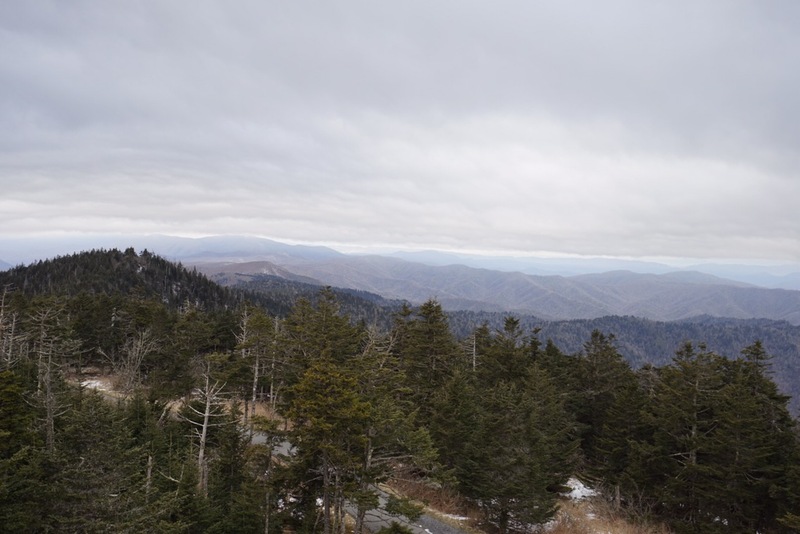 At least today, the cloud and mist layer would be just high enough to get some awesome views from Clingman’s Dome. 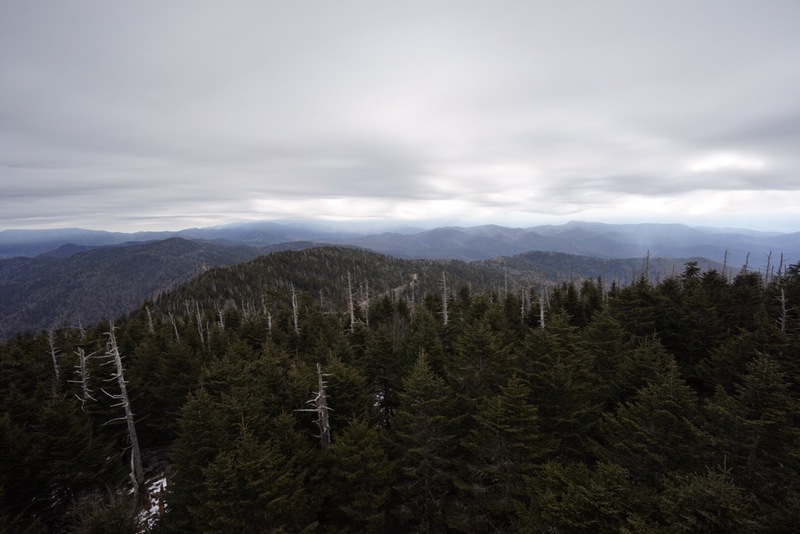 Clingman’s Dome is the highest point on the AT at just over 6600 feet. 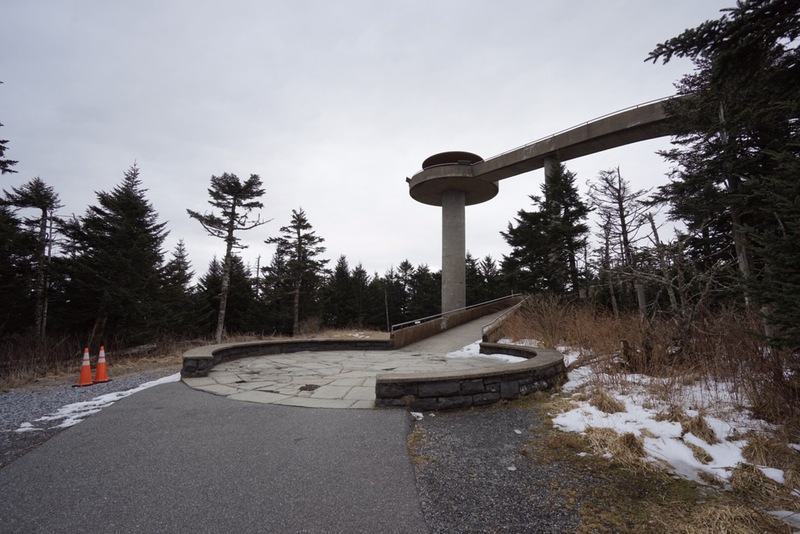 Unlike other national parks, which tend to blend their buildings with the natural landscape, the Smokies decided to build the Jetsons home at the end of a curving, concrete walkway. Unsurprisingly, it was built sometime in the ’60s, an architectural dark age if there ever was one. 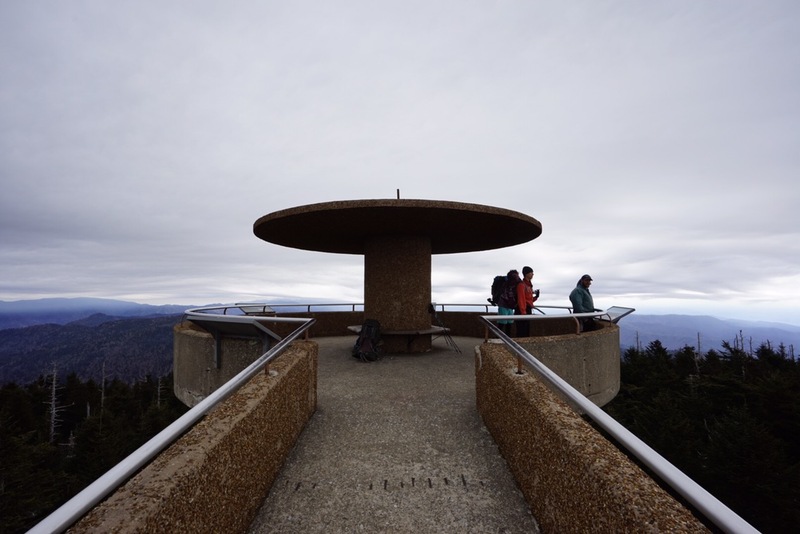 We stayed on the tower for some time, relishing the 360 degree views. A low cloud ceiling, mixed with heavy winds, formed undulating waves in the sky. 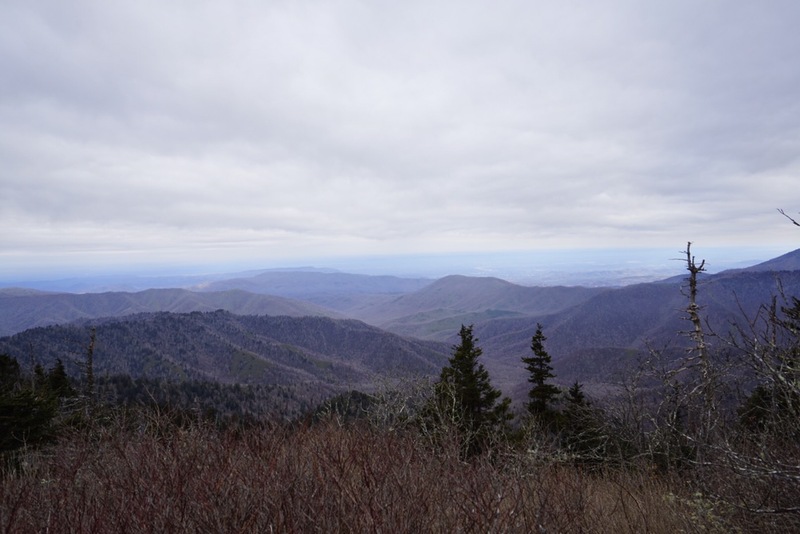 Descending from Clingmans was beautiful, but as frustrating as trying to kill someone with a feather. Solid, and sometimes sheer ice for miles. It was very slow going. 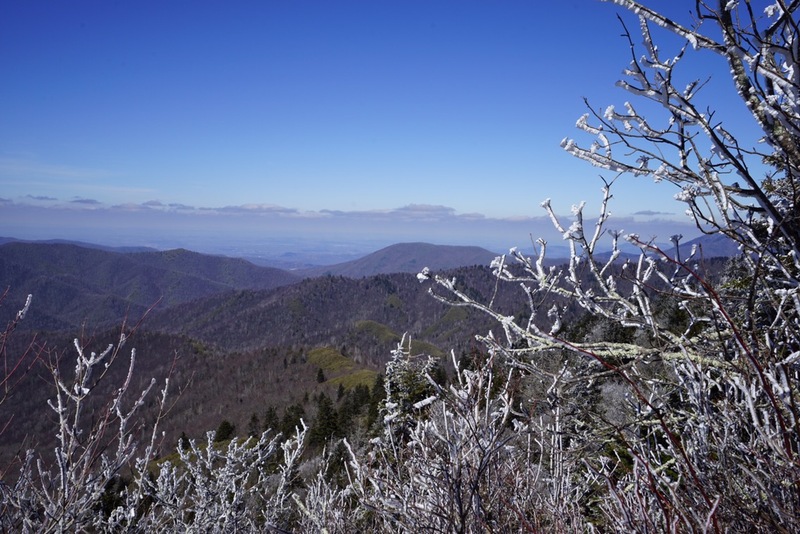 Luckily, as we got lower in elevation the ice began to disperse. 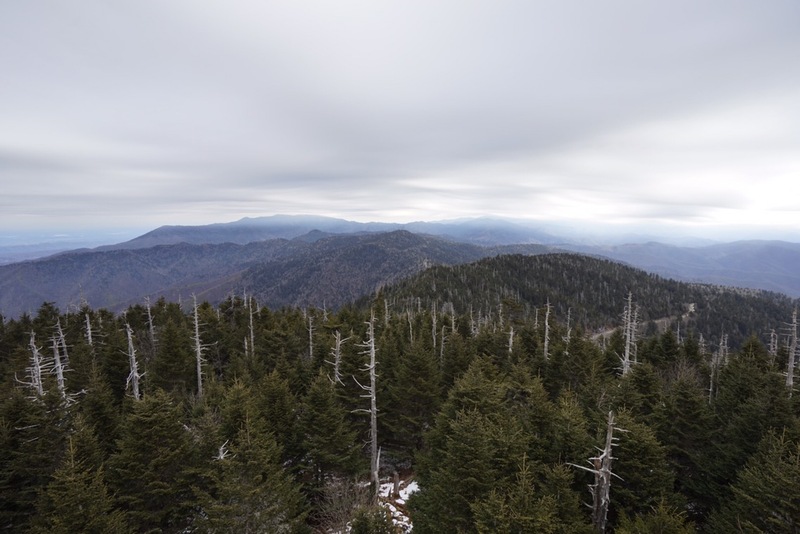 Before we hit Newfound Gap, the trail became a graveyard of torn trees. 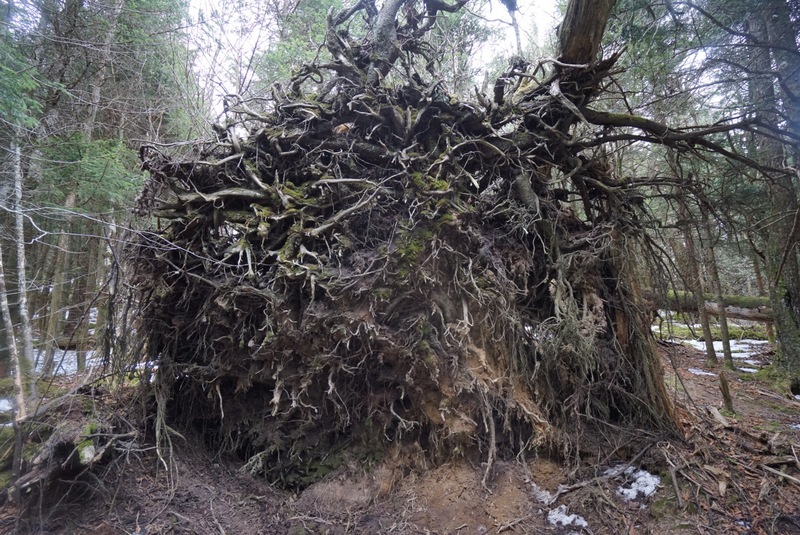 Gnarled roots had ripped giant stones from the earth in a fruitless effort to save themselves. It was incredible to walk past a 12 foot high root system. 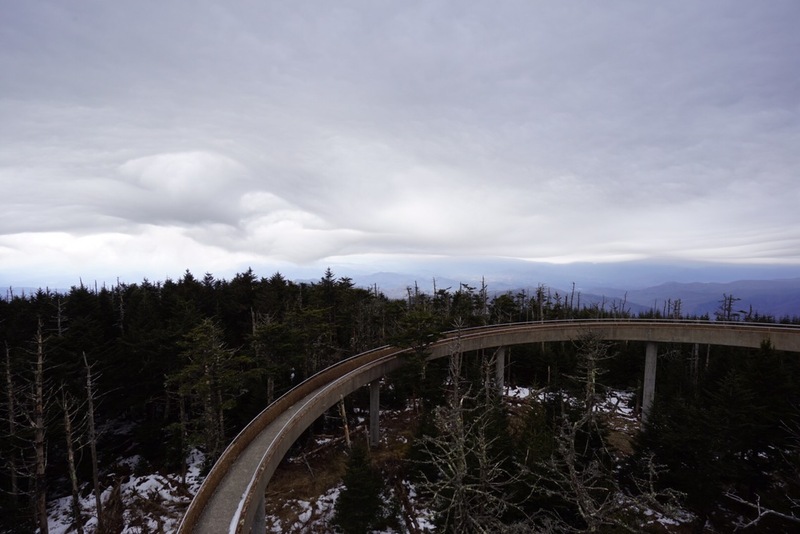 As the cloud ceiling lowered, stifling the views and threatening rain, we hit Newfound Gap. We decided to go into Gatlinburg to resupply and crush some town food. Like everytime thus far, we’d spend the night there.